Saint Matthias the Apostle - My Catholic Life! Conservative Muslims believe that any territory that was once settled and governed by the adherents of Mohammed pertains forever and always to the Caliphate. Once Islamic, always Islamic. To illustrate, it took many generations for the Islamic fist to finally loosen its grip on Spain. Yet despite the Muslim armies being pushed back into the waters of the Mediterranean in 1492, some strict followers of Mohammed still dream of former glories and hope that Al-Andalus (Muslim Spain) will one day re-emerge. Catholicism harbors no such illusions of glory for formerly Catholic lands, but it does practice a theological form of “Once Catholic, Always Catholic.” Many Bishops who serve in the Roman Curia exercise no authority over a diocese. Auxiliary bishops likewise lack a territory. These two categories of bishops are thus given a “titular” episcopal see. It is a see in name, or title, only. The see is normally that of an ancient diocese whose existence ceased due to, typically, Muslim invasion. The custom of assigning “titular” sees to some bishops not only preserves the memory of lost peoples and dioceses, it also has some theological support. A bishop and his diocese are united, like spouses, in a marriage arranged in Rome. That’s why a bishop wears a ring. And a diocese, once created, cannot remain a widow. A new bishop is always appointed to be wedded to it. A diocese must have a spouse, even if he is a long way from home in distance and time. Titular bishops succeed in the present, if only in name, the past bishops of now defunct dioceses. The tradition that all bishops, beginning with the Apostles, must have successors is rooted not just in the early Church but in Judaism. The Twelve Apostles are more often referred to in the New Testament by their number than their names. They are, simply, “The Twelve.” This custom is rooted in the twelve tribes who settled the land of Canaan after the Exodus from Egypt. These tribes were founded by the twelve sons of the Patriarch Jacob, later renamed Israel. It was inside of this Old Testament Jewish tradition that Jesus Christ acted when He chose twelve men upon whom to found His Church. Jesus specifically states that His followers will sit on twelve thrones judging the twelve tribes of Israel (Mt. 19:28, Lk. 22:30). And the Book of Revelation states that the names of the twelve tribes of Israel will be written on the gates of the Heavenly Jerusalem (Rev. 21:12 ff). It was fitting, then, when “The Twelve” were reduced to “The Eleven” after Judas’ self murder, that the fullness of the biblical number had to be restored. And this is where today’s saint steps out from the shadows to play his role in Christian history. The first chapter of the Acts of the Apostles, the great history book of the early Church, tells us that, after the Ascension, the eleven Apostles returned to Jerusalem. There, Peter “stood up among the believers” to tell them that someone who had “accompanied us during all the time that the Lord Jesus went in and out among us… must become a witness with us to his resurrection.” Two names were proposed to replace Judas: Matthias and Joseph called Barsabbas. Then the Eleven prayed to the Lord to show them the way. They cast lots. Matthias was chosen. An Apostle, for the first time, had a successor. And, of equal significance, the appointment came from the group, or college, of Apostles, led by Peter. Thus was established, just days after Christ left the earth, a form of Church preservation and growth which would be repeated, and is still repeated, tens of thousand of times in Christian history. 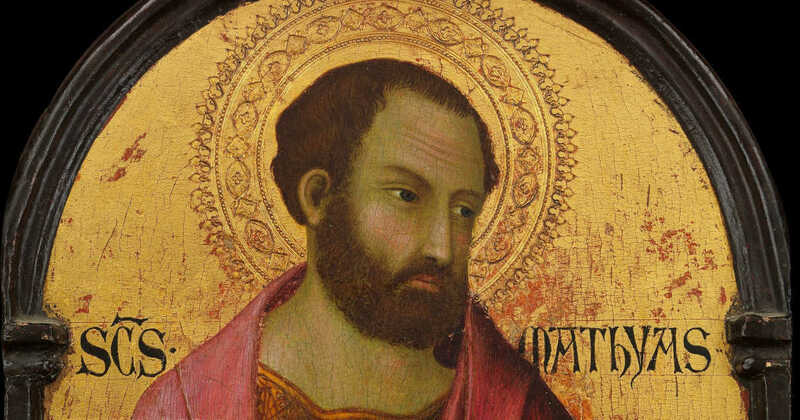 The Church has placed the Feast of St. Matthias purposefully close to the Feast of the Ascension, just as his election in Acts occurred so soon after that event in the Bible. The Holy Spirit had yet to descend at Pentecost, and still the Church performed the will of God with authority in selecting Matthias. It was all there in the beginning. It is still here all around us. The miracle of the Church and her Apostles continues. It will always continue. 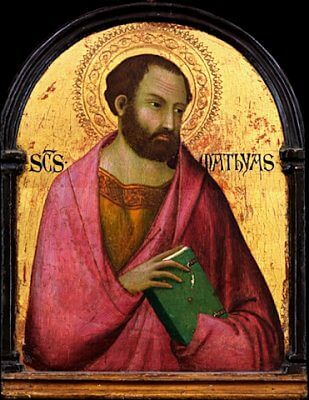 Saint Matthias, we beg your intercession from your powerful throne in the Heavenly Jerusalem, that you fortify all who govern your Church to emulate “The Twelve” in their wisdom, trust, prudence, and daring in leading and spreading the Faith.